The way to play Xonotic is with a good surround sound. For anybody out there that wants to play Xonotic to it's fullest, you'll want to set up a decent surround for it. Next paragraph is background info, you can skip it. On occasion I will toy around different ways to set up commonly done audio setups. Through this experimentation I've been able to create what is in my personal experience, a flawless gaming surround for 5.0/5.1/5.fake 2 configuration. This guide is put together under the assumption that you only have a reciever and no speakers. One quick note about my sound experience is that I am in no way a professional at this stuff and I don't just go around seeing what other people do either. With the exception of a few basics, this is all done out of my own experimentation. This guide is intended for PC gaming, I have yet to find a home theater setup that works better than the standard layout. Center: A PAIR of two (woofer and tweeter) or three-way (low, mid, tweet) fairly small magnetically shielded (these will be near your monitor) bookshelf speakers that have bass-reflex (these have ports, holes, or ducts) and twice the impedance of your reciever as well as half the wattage of the rest of your speakers (you'll see why later). Corners: Four IDENTICAL two or three way speakers that are significantly (preferably 3-4 times) bigger than your center bookshelf speaker pair. I recommend NOT using bass relfex (these have ports, holes, or ducts on them) speakers for corners. Depending on monitor size, you'll want to either place your cetner pair either to the sides of your monitor, or if possible directly under it. The more you spread them, the more you'll have to turn them to face you. You'll also want the tweeters to be at ear-level. The cetner speaker pair will be closer to you (except maybe the sub) that any other speaker. 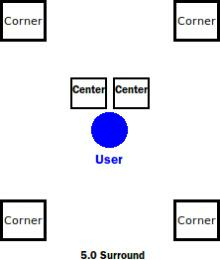 Ideally, you'll want the corners at EQUAL distance from where you are sitting. Depending on the spread of them you may chose to make them face each other directly or aim them at you. If you can not place them equally then you'll have to balance them out with your volume controll so that they all sound equally loud. The tweeters should also sit a few inches HIGHER than the ones that are on your center pair. Depends on type. Standard reflex towers should be placed directly under your desk as should front-fire and down-fire. Chair subs obviously get mounted on the back of your chair. If you just happen to have A PAIR OF DOWNFIRES (Oh yeah!) you will want to place one to each side of you slightly in front of your chair. Alternatively you can decide that your corners are good enough with bass that a sub is not needed. Center Pair: Your two speakers will need to be hooked up in PARALLEL. To do this, run a set of wires of EQUAL length from each speaker to your center output on your reciever. Corners: Regardless of where you place your speakers, you will need to use THE EXACT SAME LENGTH OF WIRE FOR ALL YOUR CORNERS. It should be noted that the image was meant to display location of each speaker, but not size. Also you should look at the frequency responses and decibels of any speakers your looking at. Higher frequencies handle sharper high-pitched sounds while lower handle your duller low-pitched bass. A good speaker can handle all those ranges really well. Your average speakers to my understanding usually respond to 20hz-22khz. Decibels measures loudness, most speakers have right around 90dB. Also you should keep in mind that HIGH WATTAGE DOES NOT MEAN LOUDER OR BETTER SPEAKERS, hell in my mind that just means they're inefficient with it's power usage.